The belt is removable, so if you don't want it flopping around, it's easy to take it off. Super cute and I couldn't believe the price! I am wearing a small and it fit great. 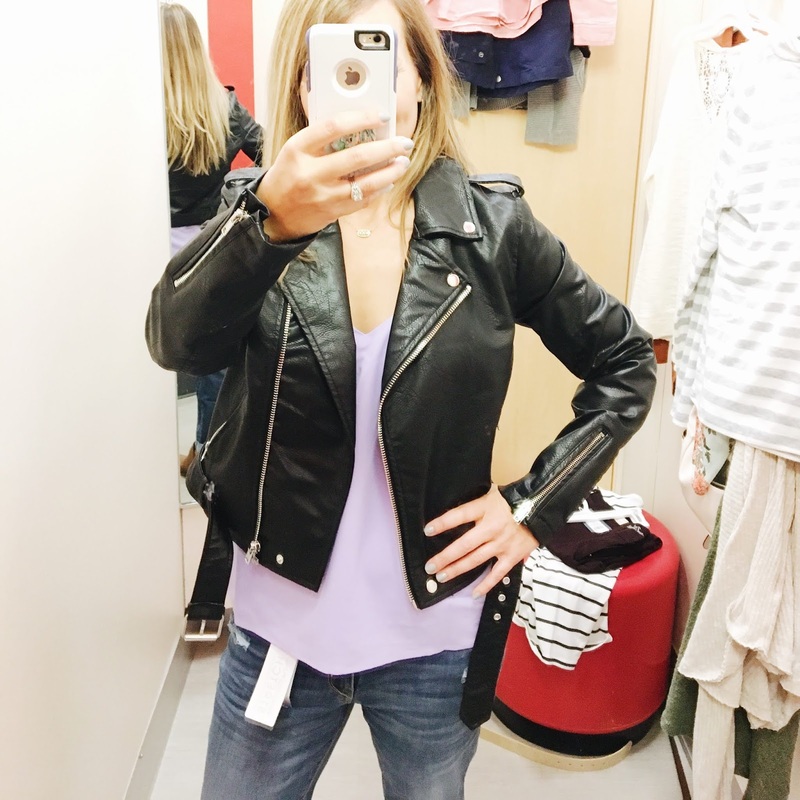 Not sure I would want to wear a bulky sweater under this jacket, but I loved it with a thinner long sleeve tee! These are the boyfriend style jeans from the Levi's line at Target. I liked them a lot, but I will say they were a tad on the low-rise side, especially in the back. I am wearing my normal size, and I feel like they fit true to size--just slightly baggy like boyfriend jeans are supposed to be. If in between sizes, I would go down. They had a little bit of distressing, and I liked the color of the denim. This is the lighter wash option. I am wearing these jeans for all of the pics in this post. This cutie button up shirt has a vintage wash vibe, and I just loved it! It also comes in olive green and charcoal grey. Shirts like this are so versatile because they can double as a lightweight jacket. I just knotted the corners and it gives a more tailored look. Fits true to size, I'm wearing a small. This navy striped boatneck shirt is a good layering piece. It ran small, and had a snug fit. This vintage wash, oversized sweatshirt was super comfy! I am wearing a large, as it was the smallest size they had in the store, but I would probably go with a medium instead of a small to keep the oversized look. I liked this utility vest because it is longer than most I have seen. For those of you who like things to cover your bum, this is perfect! It runs large, so size down. I'm wearing an x-small, and it was still plenty roomy. I love all the pockets, and there is a drawstring waist, so you can cinch it to prevent it from looking so boxy. Also available in plus sizes. This long sleeve stripe tee deserves a mention because it is so soft, has a great length, and is a perfect basic item for layering. And, it's only $10! This sweet little cami is perfect for layering under cardigans and jackets! (ignore my bralette. I obviously wore the wrong kind of bra for this try on session!). I am wearing an XS, so definitely size down unless you have a large chest. And, this leopard print cardigan was begging for me to try it on! It's cute worn open, or you could button it up and wear it as a sweater. I'm wearing a medium in the leopard. The same cami also comes in this pretty lavender color and grey. And, another great cami option is this one with lace trim. Comes in black, pink, and olive. This cardigan was nice and cozy. They only had a large in store, but I would probably go with a medium. It was soft, not itchy at all, and I love the scallop slit on the sides. It also comes in black, brown, and a lavender color! Incase you missed my previous post featuring Target shoes, you can check that out HERE! Thank you so much for shopping through my affiliate links! I love doing these try on's for you, and I appreciate you supporting me. If you don't already know, most of the links I provide in my posts allow me to make a small commission if something is purchased through them. It's not much, but it adds up and helps me justify the time I spend on writing these posts for you! Don't forget to check back later this week for Part 2 of All Things Target! You won't want to miss it!